Home / 2013 / September / 25 / Rising UP! Celebrating Indigenous Youth Arts and Performance. 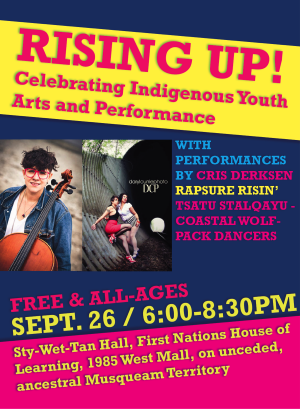 Join us on September 26th, 2013 for Rising UP! Celebrating Indigenous Youth Arts and Performance. Taking place just one week after the historic Truth and Reconciliation National Event in Vancouver, this concert will showcase some of the best Indigenous music, art, performance, and dance in the lower mainland. Come out and celebrate cultural revitalization, innovation, and resurgence! This is a FREE + ALL-AGES event. Everyone in the community is welcome to join us for this celebration! Come early to make sure you get a spot! The show will be held on the unceded, ancestral territories of the Musqueam people.